Wen Ho Lee, a patriotic American scientist born in Taiwan, had devoted almost his entire life to science and to helping improve U.S. defense capabilities. He loved his job at Los Alamos National Laboratory and spent his leisure time fishing, cooking, gardening, and with his family. Then, suddenly, everything changed and he found himself in the spotlight, accused of espionage by members of Congress and the national media and portrayed as the most dangerous traitor since the Rosenbergs. He was even told that their fate - execution - might well be his own. Although Dr. Lee was horrified by these words, he knew he was innocent and believed that this was all a big mistake that would be cleared up quickly. But in December 1999, his worst fears were confirmed when he was manacled, shackled, brought to jail, and put in a tiny, solitary-confinement cell, where he would remain for the next nine months. His arrest sparked controversy throughout the country; it triggered concern for national security, debate about racial profiling and media distortion, and outrage over a return to McCarthy-era paranoia. Throughout the ordeal, Dr. Lee steadfastly maintained his innocence. Now, at last, he is free to tell his story. In this compelling narrative, Dr. Lee chronicles his experience before, during, and after his imprisonment. He takes readers inside Los Alamos and discusses how violations of national security occur in many government agencies. He describes how the FBI infiltrated his private life - lying to him and spying on him for nearly two decades. He relates his own anti-Communist stance, the result of tragic events from his past, and tells how he assisted the FBI to help protect nuclear secrets. He explains the role that the New York Times and unsourced "leaks" played in the country's rush to judgment. He details his harsh treatment in jail and how citizens can be incarcerated solely on government allegations and without factual justification. Finally, Dr. Lee accounts for why he downloaded codes, demonstrating once and for all that he is innocent of every charge leveled against him except for one, a security violation that many others had committed. 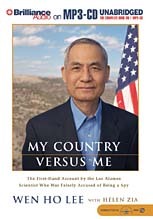 A riveting story about prejudice, fear, suspicion - and courage - My Country Versus Me offers a revelatory first-hand account of one of the major abuses of our government's power in our time.